The Ukrainian IT industry now employs 99,940 people — up from 89,300 last year — according to the latest report of DOU.UA, an authoritative industry resource. The figure includes programmers, QA specialists, project managers and other IT-related professionals. Almost half of these professionals live in Kyiv (Kiev). Others are inhabitants of such other major Ukrainian cities as Kharkiv (Kharkov), Lviv (Lvov), Dnipro (previoulsy known as Dnipropetrovsk), and Odessa. With its Ukrainian offices in Kyiv, Dnipro, Lviv, Kharkiv and Vinnytsia, US-headquartered EPAM is the biggest employer in the industry. Among other industry leaders are such companies as SoftServe, Luxoft, GlobalLogic and Ciklum, if judging by the number of employees, says the report. With monthly salaries reaching or exceeding $3,000 for certain specialties, remunerations in the Ukrainian IT sector are high or very high by local standards. Women are becoming more interested in the field. This year the share of female specialists now reaches 15%, up two percentage points from last year. This entry was posted in Business & Prices on December 10, 2016 by RomanInUkraine. Prominent Ukrainian capital investors and business angels discussed their algorithms for investing in Ukraine’s tech industry at the Lviv IT Arena conference on Oct. 1. And all agreed that the process of investing, either in big tech companies or small startups, could be made simpler and easier if the government did its part by passing better laws and improving the economy. This entry was posted in Business & Prices on December 6, 2016 by RomanInUkraine. This entry was posted in Business & Prices on November 22, 2016 by RomanInUkraine. This entry was posted in Business & Prices on October 20, 2016 by RomanInUkraine. But the creation of partnership between investors and entrepreneurs is not entirely dependent on figures and business plans, she said. Digital Future CEO Oleksii Vitchenko agreed: “People are the most important asset in any startup.” However, he said that there’s another important thing startups should have to attract his attention – companies should be focused on global markets. “We want to invest into something digital that can compete globally,” Vitchenko said. The Oct. 1 investment panel discussion at the conference was focused on details of putting money into companies, and, according to managing director at HP Tech Ventures Vitaly Golomb, the final goal isn’t only to earn money after investing. “We’re investing in a third technology revolution,” Golomb said. This entry was posted in Business & Prices on October 6, 2016 by RomanInUkraine. – After a short-lived decline in 2014, the Ukrainian IT sector demonstrated record growth in 2015. Not only did the market regain its strength, it significantly exceeded the activity level of any previous year, according to UADN’s report. – The investment market reached an unprecedented $132 million in total volume in 2015, demonstrating a 240% growth from the year before, when the market shortened by over 55%. – The growth of investment volume in 2015 was mainly the result of three large-growth stage deals, while early-stage investments slightly decreased. – Startups oriented to the local market are likely to continue facing difficulties connected with the contraction of the Ukrainian economy and its currency fluctuations. However, there are also a number of winners that profit from such market conditions, including leading e-commerce players. – Globally-oriented startups attracted more investments in 2015. Many of the teams have moved to their primary product markets, raised follow-on funding from international sources, and kept their R&D teams in Ukraine. 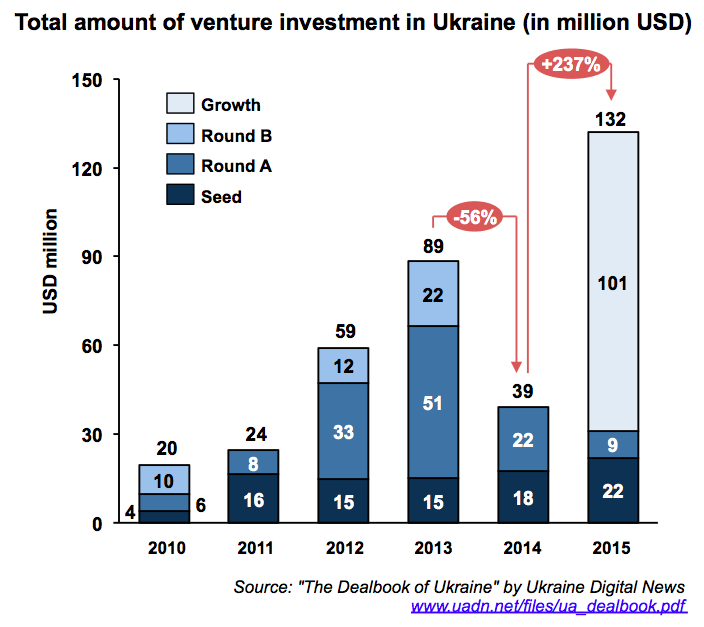 – Foreign investors kept interest in the Ukrainian tech sector, making or leading more than 40% of the deals in 2015. – In 2015, Ukraine saw the trend of well-known foreign companies acquiring domestic startups, offering global products, continue. The year’s largest acquisition was that of the Looksery image-processing app by Snapchat for a reported $150 million. – Growth-stage deals emerged as a new transaction class, accounting for $100 million of the total investment volume. Among notable new growth-stage investors was George Soros, who promised to commit $1 billion to Ukraine, with the tech sector figuring on his priority investment list. – The 2014-2015 period was marked by a government push for reforms. The IT sector played a major role in the design and implementation of some of the most widely recognized and successful reforms, including those addressing deregulation and e-government. This entry was posted in Business & Prices on June 29, 2016 by RomanInUkraine. This entry was posted in Business & Prices on June 21, 2016 by RomanInUkraine. Cool software solution for transparent gov’t contracts. This entry was posted in Business & Prices, News & Views on May 6, 2016 by RomanInUkraine. This CEO is an acquaintance of mine. This entry was posted in Business & Prices on March 20, 2016 by RomanInUkraine. This entry was posted in Business & Prices on March 19, 2016 by RomanInUkraine. “We (the Dutch farmers – ed.) have the knowledge in agriculture which we can apply here on a big territory. I am a son of a farmer, so for the Dutch farmers Ukraine is like a dream: you have so much very fertile lands, you can improve your production so much and you can really make big steps forward.” Ir. J. H. (René) Kremers says, Difco International director. The company participated in an annual international exhibition of the innovative solutions in grain business “GrainTechExpo – 2016” which took place in Kyiv this February. This entry was posted in Business & Prices on March 15, 2016 by RomanInUkraine. YouAppi, a San Francisco-based startup that has developed a Big Data-driven solution for mobile marketing, has raised $13.1 million from an international consortium of investors, including Ukraine’s Digital Future. Also participating in this Series B round are Click Ventures, Emery Capital (Russia), Global Brain (Japan) and Hawk Ventures (USA), Israeli funds Glilot Capital Partners and 2B Angels, as well as AltaIR Capital and Flint Capital, two funds operating essentially from Russia and Israel. Flint, Glilot and 2B Angels had already put $3 million in YouAppi’s Series A round in October 2014. The funding will be used to enhance YouAppi’s products and accelerate growth in China, Japan and other growth markets, while moving the company’s headquarters to San Francisco. Initially based between Israel and New York, the startup also has offices in Beijing, Berlin and London. Launched in 2012, YouAppi “enables the world’s leading apps to find the right customers at the right conversion price across countries and verticals, based on post-install event analytics.” Its proprietary predictive algorithms can “analyze the usage habits of 1.5 billion users of 3,500 mobile apps and sites.” These include The New York Times, Pandora, EA, Orbitz, Zynga, Yandex, Wayfair, and Viber in 200 countries via 100 billion impressions monthly, the startup claims. In Asia, YouAppi works with Baidu, UC Union (Alibaba Mobile Business Group), Sungy Mobile, Apus, NewBornTown, Kika and Bandai Namco, as well as global YouAppi clients. The company expects its Chinese revenue to double in 2016 from 10% to 20% of its global revenue. This entry was posted in Business & Prices on February 27, 2016 by RomanInUkraine.